I have visited four Hawaiian islands in total over the past few years and I loved them all, but for different reasons. I love Maui for it’s swimmable waterfalls. I love Kauai for it’s lush greenness. I love the Big Island for the volcanic activity. I love all of them for their beaches. And I love Oahu, but particularly the North Shore of Oahu, because it is laid back and undeveloped. And because the North Shore beaches are some of my favorite beaches anywhere in the world. Compared to the other islands I have visited, Oahu can be a hard island to love. Sure, Waikiki is beautiful but it is crowded. And with urban sprawl creeping out in all directions from the largest city in Hawaii – Honolulu – a lot of the island feels like it has lost it’s Aloha: it’s love and connection to the land. One of the exceptions to this is the North Shore. The North Shore of Oahu is different. It’s not about shopping or fine dining like in Waikiki. It’s about soaking up nature, swimming in the ocean, eating at an iconic North Shore shrimp truck, and riding a bike along the beachside bike trails. It’s about the simple life and that is why I love it. A visit to the North Shore is definitely one of the best things to do in Oahu. And even if you don’t have a lot of time to spare, a North Shore day trip from Waikiki is perfectly feasible. I first visited the North Shore of Oahu with my ex back in 2009, during a four and a half month around the world trip. We stayed in a local surfer’s former house which became a guesthouse after he died in 1995. The location is perfect, right across from Three Tables beach and only 100 metres down from the supermarket, the only shop in the area. Compared to the resort town of Waikiki, the North Shore of Oahu is very sleepy with only one resort, Turtle Bay, which is located at the north eastern corner of the coast far from where we were staying. Going back six years later on this trip I was worried that the urban sprawl may have finally reached the North Shore of Oahu despite the locals constant fight to ‘keep the country country’. Thankfully I hardly noticed any changes at all. I took the bus up there from Waikiki through the middle of the island. The endless homogenous suburbs of Honolulu stretched out as far as the eye could see, merging into identical smaller towns. Only when we finally saw the ocean of Oahu’s North Shore nearly two hours later did I see fields of grass again, instead of asphalt roads and super stores. We had reached the country. I changed buses in the small town of Haliewa, stopping for a bit of a look around. It looked different than I remembered it with more tourist shops selling souvenirs and macadamia products than six years ago. Small wooden shop fronts that looked like a film set for a technicolour wild west film lined the main street. They were pretty but they screamed tourist. One of the many things I love about Hawaii is the plate lunches and food trucks. There were food trucks in Hawaii before they ever got popular on the main land but there is about ten times as many these days. That suits me just fine. Haliewa had a very large number considering how small it is, including a small food truck village where I ate lunch. The coconut prawns with garlic sauce, rice and salad was beautiful and I loved that it was garnished with an orchid. The Hawaiian touch. I had missed it. Make sure to try Giovanni’s Shrimp Truck – the original shrimp truck on the North Shore and so delicious and garlicky. And if you want to grab a shave ice – Matsumoto Shave Ice is renown as the best. Further east along along the north shore is a string of gorgeous powdery white sand beaches including the famous Waimea Bay and Pipeline which are prime surf spots in winter but are calm enough to snorkel at in summer. Three Tables beach where we stayed last time around is one of these beautiful north shore beaches. I booked a dorm at the same hostel complex that I stayed at six years ago but in the Plantation Village, a cluster of small houses which are either house double rooms or dorms. The dorm rooms in the house I was in were empty except for two people staying in the room next to mine which was connected by a doorway with no door. It was pretty basic and not as nice as the Back House but it would do for one night. I was pleasantly surprised at how little this part of the North Shore of Oahu had changed. The supermarket is still there and across the road there is a snorkel and bike hire shack and a small Surf Shop. Further along is a small food truck village with a shared seating space. But that was all. Not too bad considering Hawaii is part of the United States. The developers have been kept at bay, at least for now. It was raining when I arrived. The weather on Oahu at this time of year can be unpredictable. It passed over once I had settled into my room so I decided to take advantage of the late sunset and go for a walk to Sunset beach along the walking/biking path, 6km return. This is the path where I had my epiphany back in 2009 where I realised that I loved walking and that I had finally found a hobby that made me happy. It is a pretty special place for me. It winds alongside beaches and through thickets of subtropical foliage. Fragrant hibiscus and frangipani scented the air and gave colour to the dark green surrounding me. Bread fruit and mangoes hung from the branches around me but were out of reach. Wild chickens and their chicks constantly crossed in front of the path as I walked along. The sun came out from behind the clouds when I reached Sunset beach and I sat on the sand, soaking it in. Dark clouds drifted over the mountains behind me and threatened rain. Walking back halfway along the beach, the drop off to the ocean was steep. Houses reached right up to where the sand began and looked as if they would slip down the massive sand dune at any moment. Back at Three Tables Beach across from the hostel I had a pre-sunset swim then watched the sun slowly sink into the ocean in an explosion of reds and oranges. An endangered monk seal with a distinctive green tinge lazed on the beach beside me, smiling it’s chubby smile. The next morning was all about the crown jewel of the north shore beaches, and my favourite beach in Hawaii: Waimea Bay. This perfect crescent of golden sand is backed by verdant green mountains and a lush river valley. The church tower overlooking the beach is an iconic sight and immediately identifies Waimea Bay for me when I see it. The crystalline water is great for snorkelling in summer and it was the first place I ever swam with a sea turtle. Lying in the sand and taking a dip in the tropical waters when it got too hot was how I spent the first couple of hours before deciding to risk leaving my camera on the beach to go for a quick snorkel. I was really lucky and within minutes of getting in the water by the jumping rock I saw a group of boys looking at something pretty close to shore. It was a massive turtle. I don’t know anywhere else in the world that you can spot a turtle only metres from the beach. It was eating seaweed off a large rock and wasn’t bothered with me hovering over it, only glancing at me briefly before continuing with its meal. I also saw a few tropical fish but I didn’t dare stay out too long with my valuables on the beach unattended. One of the downsides to travelling alone. In the winter months, you can spot whales just offshore too. If you are visiting the North Shore of Oahu you should definitely make the time to go to the Waimea Valley, a lush botanical garden that is scented by tropical flowers. Walk through the valley and learn about the Hawaiians who called this place home, and see the recreation of a traditional village. Swim in Waimea Falls, a beautiful waterfall at the end of the valley that you may recognise from the TV show ‘Lost’. Finish the day with dinner and entertainment at the Toa Luau, one of the best luaus on Oahu with a show incorporating different cultural performances from islands across Polynesia, and demonstrations of Hawaiian cultural traditions such as making coconut milk, braiding flax head bands, and preparing bananas to be cooked. It is one of the more traditional luaus and is a great way to incorporate Hawaiian culture into your North Shore trip. The best way to get to the North Shore is by renting a car but if you have the time or are lacking in funds the local bus is a great alternative. It only costs $2.50 per journey and you get two transfers to be used within two hours. It takes about two hours to reach Three Tables Beach from Waikiki if you take the route through the middle of the island and about two and a half hours if taking the more scenic route along the east coast. I stayed at Backpackers Hawaii, the only budget accommodation in the area which includes the Brown House (now called the Back House) with twin and double rooms, a Backpackers (Main House) with dorm rooms, the Plantation Village with a mix of both, or the Beach House with more luxurious (and expensive) studios. I don’t recommend staying at Plantation Village as it was quite rundown but the Back House was great (although it has been years since we stayed there). You can also rent private beach houses in the area – Haliewa and Waialua have affordable options – through Airbnb and VRBO, or if you want to splurge – you could stay at the Turtle Bay Resort. 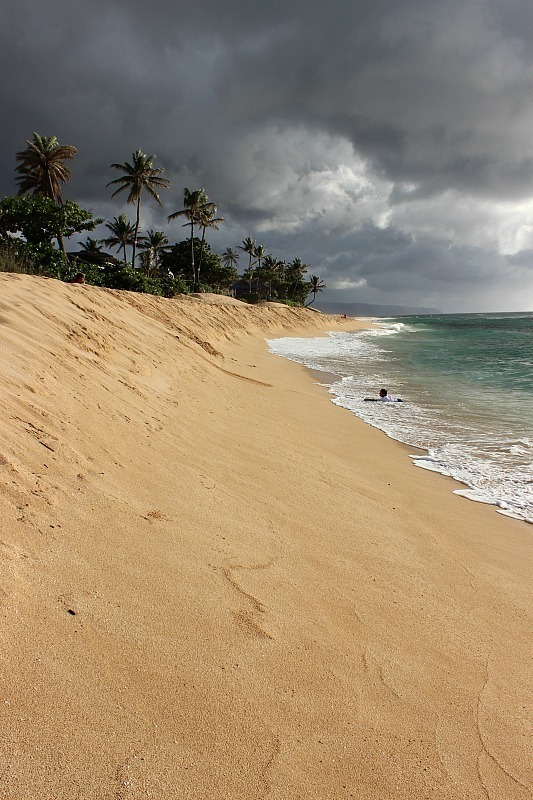 If all else fails, at least head up to the North Shore Oahu on a day trip from Waikiki. 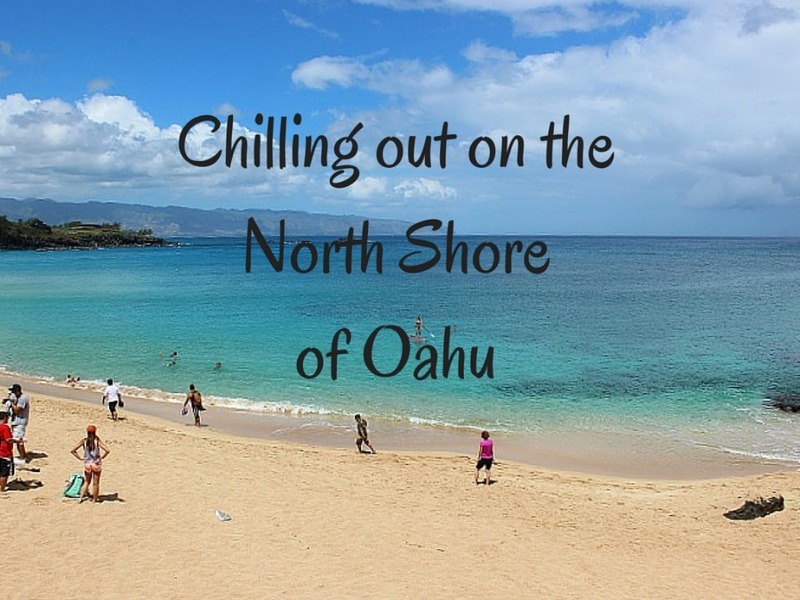 Obviously you are going to want to hang out at the awesome North Shore beaches! Definitely snorkel at Waimea Bay or Pupukea Marine Life Conservation if it is summer, or watch the big wave surfers in winter although keep in mind that you may not be allowed to enter the water at all when the waves are big. Walk or bike the path to Sunset beach and visit the waterfall and botanical gardens in the Waimea Valley behind Waimea Bay. Make sure to go to the award-winning Toa Luau while you are there, you get free entry into the Valley the same day as your Luau ticket. 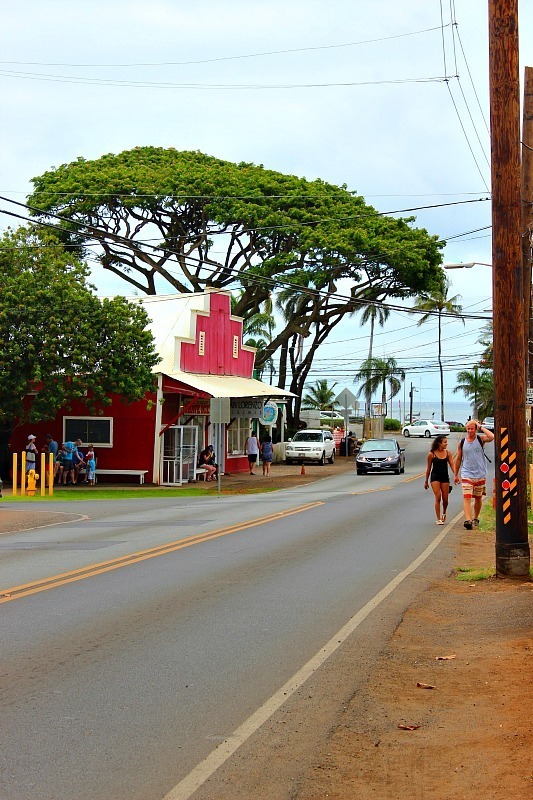 Spend a couple of hours looking around the shops in Haliewa, and grab lunch at one of the food trucks. Grab a slice of the famous Chocolate Haupia pie from Ted’s Bakery near Sunset Beach. If you want to see turtles, go to Laniakea Beach, just north of Haliewa, where they are known to rest on the beach. And just relax and soak up the awesome north shore vibe. I love the North Shore of Oahu! That is actually the first place in Hawaii I ever visited and I have been wanting to go back ever since! Looks awesome. I hope we can visit another Hawaiian island one day. What an awesome place! I can’t wait to go there too but for now I will list it down on my “Must Go Places”. I went to a conference at Turtle Bay last year and absolutely loved it. The North Shore is such a beautiful laid-back place! I bet Turtle Bay was amazing! Beautiful beaches, and love your photos! Hope we’ll get the chance to visit Hawaii soon. It’s a great family destination too Tamara! Beautiful! I’ve been hearing so much about Hawaii lately – will definitely have to put it on the list for when I do a big trip to lots of Pacific Islands. Can’t decide which island to visit in Hawaii though – so maybe island hopping…? Gorgeous pics. Definitely seems like the place to be in Oahu.